Isco 6712FR Fiberglass Refrigerated Sampler - Gripp Inc. The 6712FR is a sequential or composite refrigerated sampler designed for indoor or outdoor applications where rugged, corrosion resistant construction is required. The extensive range of programming modes lets you select the most suitable routine for your application. Programming is fast and simple, with on-line help just a key stroke away. An optional built-in telephone modem lets you change programs and download data remotely from a touch-tone phone. It also has dial-out alarm features. For automatic documentation of sample storage temperature, specify the 6712FR with optional temperature sensor. With this thermally ballasted sensor, the 6712 controller can log compartment temperatures at programmable intervals with 0.1°C precision. 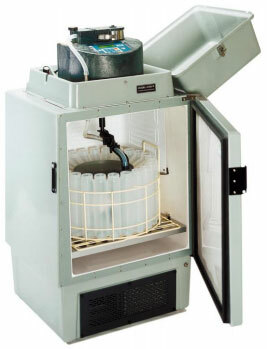 Isco FR samplers feature a corrosion-proof refrigerator cabinet molded from polyester resin fiberglass and supported by a stainless steel frame. A UV-resistant gel coat provides a smooth, non-porous finish for added protection and easy cleaning. The 6712FR uses thick, foamed-in-place insulation to keep samples preserved at the EPA-recommended 39°F (4°C). An automatically controlled, built-in heater ensures that samples won’t freeze, even when ambient temperatures drop to -20°F (-29°C). Coolant is environmentally safe R134a. Durable powdercoated epoxy, phenolic paint, and polyester tubing, protect refrigeration components against corrosion. The 6712FR provides long service life in corrosive environments, and can be used outdoors without an enclosure. For more information, download the Isco 6712FR Fiberglass Refrigerated Sampler PDF.